"Muslim appeasement and minority vote bank politics (of TRS) will be challenged by BJP," Telangana BJP spokesperson Krishna Saagar Rao said. 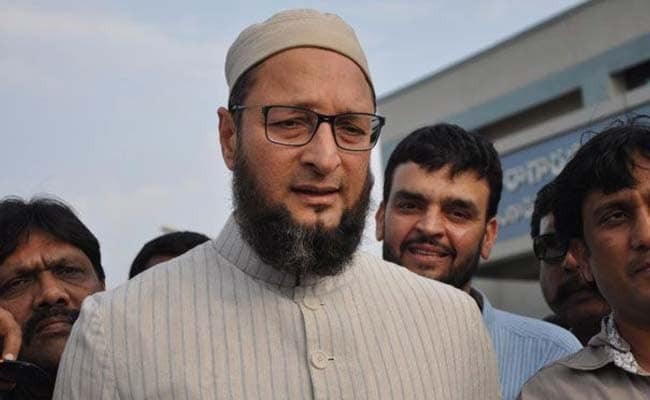 Hyderabad: The BJP is evolving a strategy to win majority of the Assembly and Lok Sabha seats in Telangana, on the lines of party president Amit Shah's "Mission 2019" at national level, including a plan to defeat Hyderabad lawmaker Asaduddin Owaisi, said a party functionary. As part of the "Mission 80" strategy, the BJP is eyeing to win 80 of the total 119 Assembly seats and 15 out of 17 Lok Sabha constituencies in the elections, due in 2019, Telangana BJP spokesperson Krishna Saagar Rao said. He said that the BJP's central unit is making a plan internally to defeat Mr Owaisi, the three-time Lok Sabha member from Hyderabad and chief of All India Majlis-e-Ittehadul Muslimeen (AIMIM). "We are working on the anti-incumbency of Asaduddin Owaisi. We strongly believe that voters of Old city (stronghold of AIMIM) are hostage to AIMIM. They don't have a choice and if they are given a clear cut choice, the entire seven Assembly segments (where AIMIM has MLAs) will vote for that alternative," Mr Rao told news agency PTI in Hyderabad. "The alternative is what we have achieved in Uttar Pradesh," he said, noting BJP's impressive performance in Deoband and other constituencies with significant Muslim population where "we won maximum number of seats without having a (single) Muslim candidate in UP." "Something similar is going to happen (in Hyderabad). We will emerge as a clear alternative to Asaduddin Owaisi and voters of all the seven Assembly segments (where AIMIM has MLAs) will clearly understand that alternative is going to win and they will vote for us. That's the plan," he said. "Plan (to beat Mr Owaisi) could be anything...ranging from fielding one of the tall leaders of BJP from elsewhere to anything else. That could be one of the plans," Mr Rao said. Amit Shah chaired a meeting last week to chalk out a strategy for 'Mission 2019' and on ways to bag more than 350 Lok Sabha seats. As a part of the strategy, he asked leaders to focus on the 150 seats which the party lost in the 2014 polls. On "triggers" for BJP's ambitious plan to win 80 seats in Telangana, Mr Rao said: "The (ruling) TRS won only 34 per cent of votes and 62 seats (in the last elections) despite at the peak of (separate statehood) movement. It's a border line victory as the magic number is 60 (in the 119-member Assembly)." "Today after anti-incumbency and so much opposition brewing at the field level, obviously they (the ruling TRS) are going to take a hit," he claimed. Alleging that TRS lured MLAs from other parties after coming to power by promoting defections, he said this strategy of the ruling party has become a "self-goal" now, as it has today three to four leaders vying for tickets in each Assembly segment. "They (TRS leaders) will defeat themselves. We are banking on that issue also, where there will be bitter opposition from TRS party, where factions will fight a bitter war against each other," Mr Rao said. He said Amit Shah is slated to visit Telangana in the second week of next month. Union Home Minister Rajnath Singh would attend a public meeting in Hyderabad on 'Telangana Liberation Day' on September 17 which is expected to be attended by two lakh people, Mr Rao said. "Muslim appeasement and minority vote bank politics (of TRS) will be challenged by BJP," he said. Mr Rao reiterated the BJP would not have electoral alliance with the TDP in the next elections in Telangana, where it would go alone. "Prior to elections, there is a possibility that the TDP Telangana unit might merge with BJP. They (TDP in Telangana) don't have any other alternative," he said.